Planes are essential in many (hand tool) woodworking projects. Because proper sharpening is a ton of work that is easily ruined in a few seconds, using the shared planes in the wood workshop requires an introduction by a tutor! They should be stored with the blade retracted to avoid damage; a better storage solution than under the Roubo workbench is needed for the long term (see issue #84). In addition, you may want to have a look at this video class (about 20 minutes in) to learn how to tune and sharpen them or this video explaining different styles of hand planes. Bench planes are made for flattening surfaces and are typically used at a workbench because you want your workpiece to held steady. The typical order of use (from rough to fine work) is scrub plane - jack plane - jointer plane - smoothing plane. Scrub planes are made for aggressive material removal, e.g. when you need to get rid of cupping or twisting in a board, and have a rounded blade to avoid tearing the wood next to the thick shaving. The "jack of all trades" among planes is of intermediate size and aggressiveness. 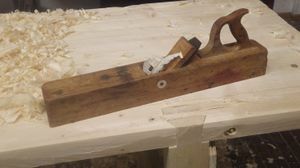 You may want to use a scrub plane in advance (depending on your stock) and follow it up with a jointer plane and possibly also a smoothing plane. Many jack planes have a double iron ("chipbreaker"/Spanbrecher -> Doppelhobel) on top of the blade which breaks the shaving - these are better suited for working across the grain as there is a reduced risk of tearout. 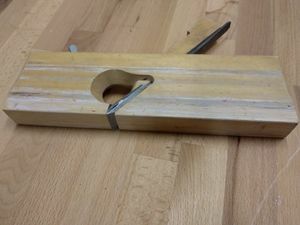 If you don't have a jointer or jointer plane at hand, it's possible to joint edges by hand with a small plane like this (with a little practice)! This huge type of plane is useful for creating large even surfaces and to joint boards before assembly or gluing, i.e. to create ideally perfectly flat and perpendicular edges. Lukas has an old Ulmia smoothing plane with a screw instead of a wedge and a metal sole. This kind of plane is designed to take of very fine shavings towards the finalization of your piece. To retract the blade, loosen the set screw a tiny bit, hold the plane in one hand and hit the metal button at the thick end with a hammer. The metal sole could benefit from lubrication with paste wax (not tried yet). 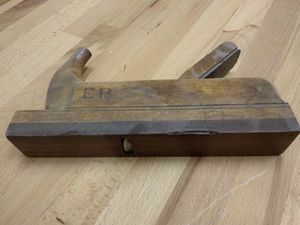 A rabbet plane is used to cut rabbets, i.e. a "step" at the edge, into wood. Used for smoothing grooves and recesses - for large or repetitive jobs, you'd rather use a power router nowadays. Our router planes have not been commissioned yet and desperately need some sharpening! Short for "surface forming" plane, a surform plane closely resembles a rasp. Use it for fairly quick and aggressive material removal, but don't expect a silky finish! The "blade" needs to be exchanged when it becomes dull. Other than single-blade planes, this one is somewhat decent for shaping plywood. Our surform plane is currently broken and needs a new handle (=> how to make one). This page was last edited on 8 December 2018, at 10:52.